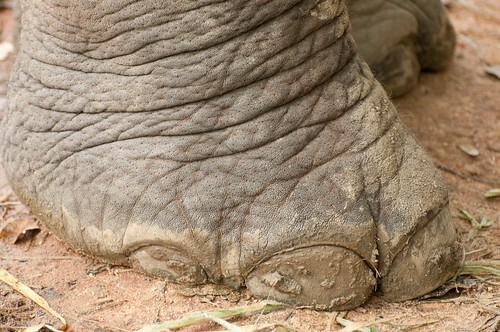 A shot of the elephant’s foot taken during my recent outing to Bannerghatta while visiting India last year. I’d definitely suggest to have a look at the large size. How can one not love this gentle giant? Its really a remarkable species, displaying almost human like behavior; offspring are raised with tender, love and care; showing an uncontrollable temper; protecting its family; displaying respect for the ones who are dead … and the list goes on. 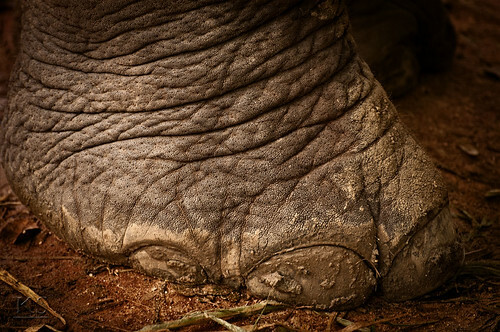 One can only feel sad when you hear or read about poaching. Hopefully one day that’ll stop too. I know a lot of my friends don’t buy those gift items made out of ivory (in fact I can’t even list one who does) – which I’m sure should have some kind of impact (no matter how little). But if you are not in those category, its never too late to say No to any ivory products and contribute a little in saving these magnificent animal. I was drawn to the texture of the skin, but just couldn’t come up with a title for it. Luckily a buddy of mine at work saw this and came out with the title for it. Thank you Gill. I would usually list the actual steps that I followed to get process the image here, but over time have realized that they pretty much fall into changing color temperature, noise reduction (if any), add curves layer for contrast, another curves layer for vignetting, resize and sharpen for the web with a finishing touch of watermark. So I’m just going to stop the text part of this section and just post the before/after image. Of course if there is any new thing I did than the usual, then will certainly list it here, but otherwise, it’ll just be a before/after shot. So if you have any specific questions on it, then don’t hesistate to ask. You can reach me either through the comments section or on my email.